The Rök Runestone, erected in the late 800s in the Swedish province of Östergötland, is the world's most well-known runestone. Its long inscription has seemed impossible to understand, despite the fact that it is relatively easy to read. A new interpretation of the inscription has now been presented - an interpretation that breaks completely with a century-old interpretative tradition. What has previously been understood as references to heroic feats, kings and wars in fact seems to refer to the monument itself. "The inscription on the Rök Runestone is not as hard to understand as previously thought," says Per Holmberg, associate professor of Scandinavian languages at the University of Gothenburg. 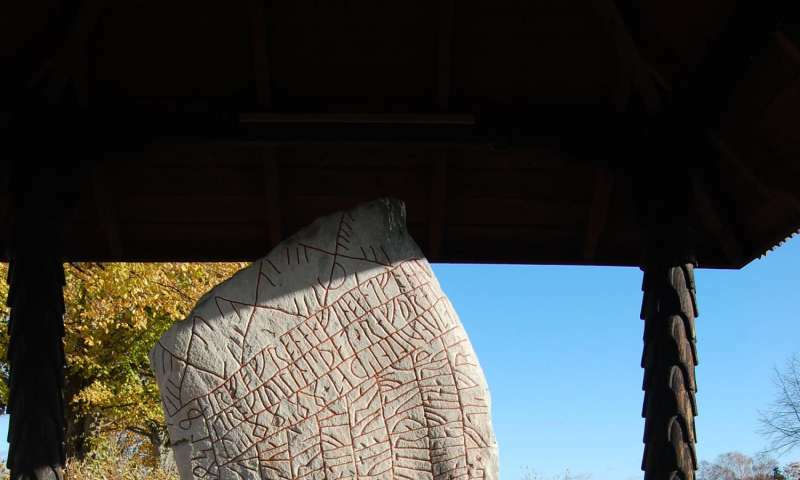 "The riddles on the front of the stone have to do with the daylight that we need to be able to read the runes, and on the back are riddles that probably have to do with the carving of the runes and the runic alphabet, the so called futhark." Previous research has treated the Rök Runestone as a unique runestone that gives accounts of long forgotten acts of heroism. This understanding has sparked speculations about how Varin, who made the inscriptions on the stone, was related to Gothic kings. In his research, Holmberg shows that the Rök Runestone can be understood as more similar to other runestones from the Viking Age. In most cases, runestone inscriptions say something about themselves. "Already 10 years ago, the linguist Professor Bo Ralph proposed that the old idea that the Rök Runestone says mentions the Gothic emperor Theodoric is based on a minor reading error and a major portion of nationalistic wishful thinking. What has been missing is an interpretation of the whole inscription that is unaffected by such fantasies." Holmberg's study is based on social semiotics, a theory about how language is a potential for realizing meaning in different types of texts and contexts. "Without a modern text theory, it would not have been possible to explore which meanings are the most important for runestones. Nor would it have been possible to test the hypothesis that the Rök Runestone expresses similar meanings as other runestones, despite the fact that its inscription is unusually long." "If you let the inscription lead you step by step around the stone, the twelfth actually appears as the twelfth thing the reader is supposed to consider. It's not the inscription that skips over something. It's the researchers that have taken a wrong way through the inscription, in order to make it be about heroic deeds." For over a century, the traditional interpretation has contributed to our understanding of the Viking Age. With the new interpretation, the Rök Runestone does not carry a message of honour and vengeance. Instead the message concerns how the technology of writing gives us an opportunity to commemorate those who have passed away. Where can I find the new interpretation's text ?